The male is larger than the female and also has a long extended dorsal fin, but this is rarely displayed. Reef compatible, but keep with other peaceful reef fish such as Clownfish. Two male Green Mandarins will fight. Their diet can be their downfall in captivity, they're known to be very fussy eaters, primarily feeding on copepods and amphipods. Some may take frozen food such as brine shrimp, but most will only accept live foods. If you are considering one of these for your reef tank, check with the store on what it's eating before buying. They're also slow eaters and may have trouble competing for food with faster tank mates. They will graze also on the live rock for algae and other morsels, but can starve if not fed properly. Be aware that the number one cause of death of this fish is starvation, and most individuals starve in captivity. This is the main reason why it is rated as very difficult. While commonly found in LFS's, and not particularly expensive, most individuals in the stores are already malnourished. A sunk-in abdomen (as viewed from underneath) is a sure-fire sign the fish is starving. Many, if not most, individuals of this species will not acclimate to accepting non-live food. Some aquarists have had success in feeding roe (fish eggs; "caviar" to humans), but this should be enriched with vitamins and HUFA supplements. If you do acquire (or manage to adapt) a specimen eating non-live foods, try feeding vitamin-enriched mysis shrimp - but ensure that there is a plentiful supply of copepods/amphipods anyway. Twice a day, target feeding is recommended, if the fish is eating non-live foods. Otherwise, be aware that this fish will graze constantly, picking copepods, amphipods, worms, etc. off your live rock and sand. A spacious tank is preferred with plenty of hiding places in the live rock. A large amount of live rock and sand are strongly recommended, as this will help ensure a plentiful supply of live food. Moreover, the tank should be well matured, with a large number of visible microcrustaceans on the rock/glass/sand. These fish are sensitive to nitrates in the tank; this needs to be kept below 20ppm. A slow but colourful fish, often found hiding in the live rock or hovering between caves. Primarily a bottom-dweller, it will "hunt" across the substrate and rock for live food to graze on. It is slower and more methodical than most reef fish, and cannot compete with more active or aggressive tank mates for food. The Green Mandarin is scaleless, and possesses a thick, poisonous slime coat that protects it from most reef predators (those fish large enough to eat it are also smart enough to leave it alone). This same slime coat renders it much more resistant than most marine fish to parasitic infections such as Saltwater "Ich" (Cryptocaryon Irritans) and Marine Velvet (Amyloodinium Ocellatus). Note that they are not immune, just highly resistant. 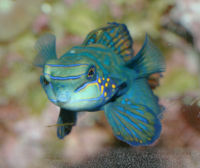 This fish is simply stunning to look at, and is one of the main draws to keep it in private aquariums. The base colour starts at yellow at the head, running to blue in the mid-section and orange in the tail. Over the top are maze-like stripes in pale blue. The fins are edged with deep blue. They have a relatively short body, large rounded fins, angular head and protruding large eyes. The males have an extended dorsal fin spike.